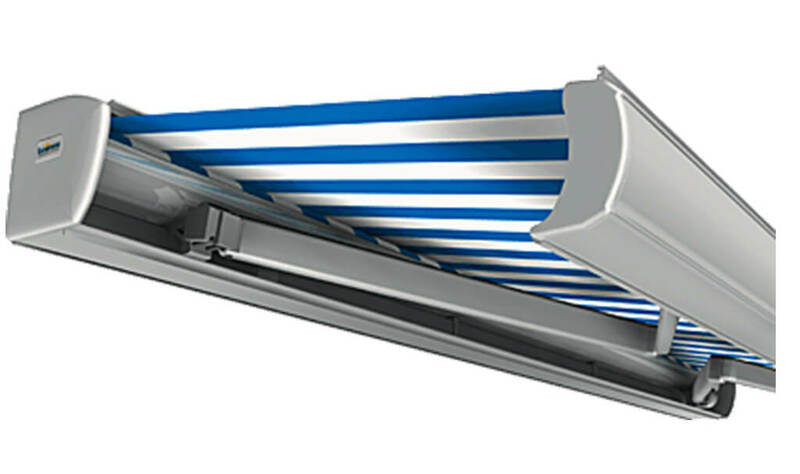 is a durable, high-quality awning, elegantly styled and with refined technical features. Compact dimensions of just 170 mm in height and 249 mm deep. The maximum area of a single unit is 650 cm wide with an arm length of 400 cm if 2 arms are fitted, or 700 cm wide with an arm length of 350 cm if 3 arms are fitted. that is closed on all sides. Extremely high spring tension of the hinged arms ensures a superbly taut sit of the fabric. Integral fabric cover shell offers an elegant solution for concealing the fabric roller. Hinged arms of aluminium with plastic-coated double cables for an extremely long service life. Arm bracket of extruded, high-strength aluminium alloy. Upper arm fork of forged aluminium. Electric motor fitted as standard, bevel gear available on request (price reduction). On single units 651 – 700 cm, units with 3 hinged arms and linked units always electric motor. Sun and wind sensor, radio control. for concealing the fabric roller. the front profile is always vertical. of the hinged arms ensures a superbly taut sit of the fabric. No resting of the awning cloth on the arm joints.